Strictly Come Dancing Judge Craig Horwood is set to come out of hiding for series 2 of children’s BBC show Big Kidz to be screened in January 2008. Clare Hodgkinson of ATIT Productions wrote to Elisabeth Piner of Having A Ball Dress Hire in Sept’ 2007 saying “The show is about a celebrity who hides in a families house for 2 days without one of the parents knowing. 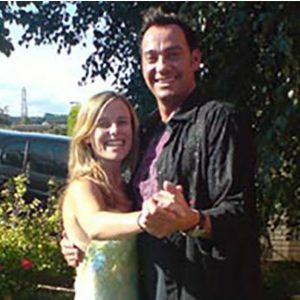 The celebrity this week is Craig Revel Horwood, judge on strictly come dancing. We are looking to get a dress for the show as it will be the theme used for all the sketches. The show is an hour long and the first series did really well with up to 70,000 viewers”. Elisabeth Piner is no stranger to dressing celebritites. She and her Kingston-based company Having A Ball Dress Hire, are called upon every year to provide dresses and dressing services for the annual Ladies Championship Ball at Wimbledon. In a note to Elisabeth Clare said “Thank you so much for the dress you gave us for the BBC show Big Kidz featuring “Strictly Come Dancing” judge Craig Revel Horwood.